I feel like this recipe is a half cheat as I am yet to make my own vegan puff pastry that’s worthy of posting. … So shop bought stuff it is! I started a mission months ago to re-create traditional pastries. It started with chocolate eclairs and there are still so many half finished untested scribbled recipes in my notebook for pain au chocolat, danish panishes and many more. 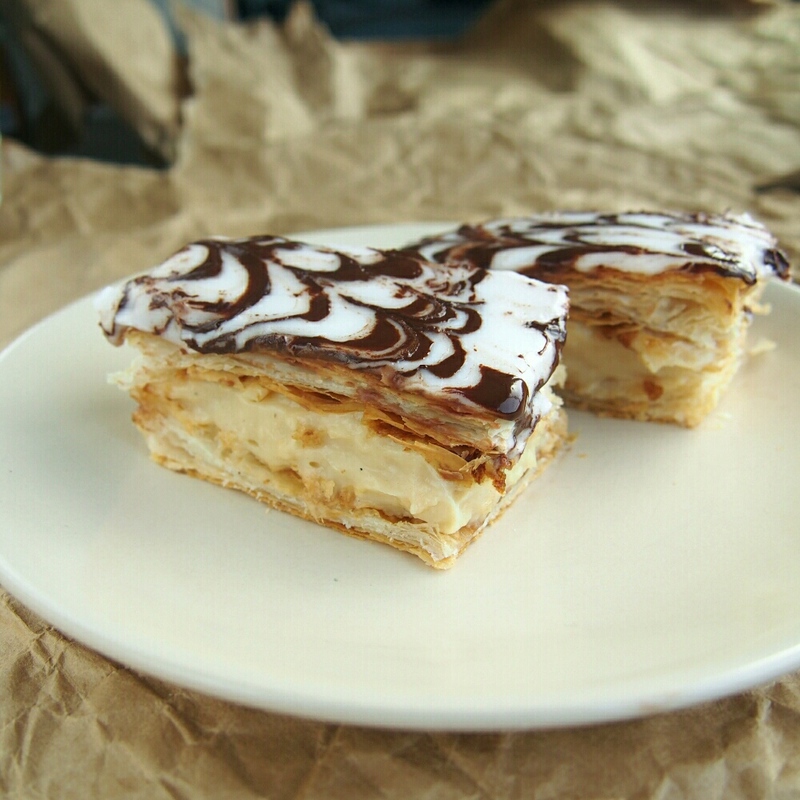 But today I am going to share my custard slice recipe, the best of British pastries! 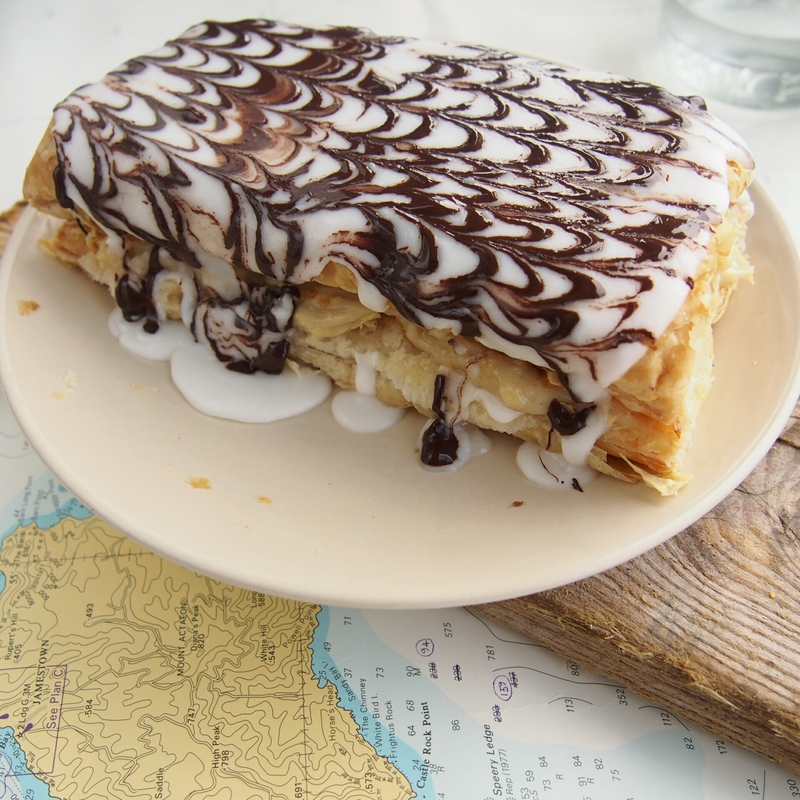 This recipe has had a lot of fails along the way, from sloppy custard to trying some of those ‘quick’ puff pastry recipes before finally deciding some things are just better bought in the shop… something I don’t say about many things! This is a nice dessert to take along to a picnic or for fancy afternoon tea with earl grey tea, scones and cucumber sandwiches. Heat oven to 200°c. Line two baking sheets with grease proof paper, or use a silicone baking sheet. 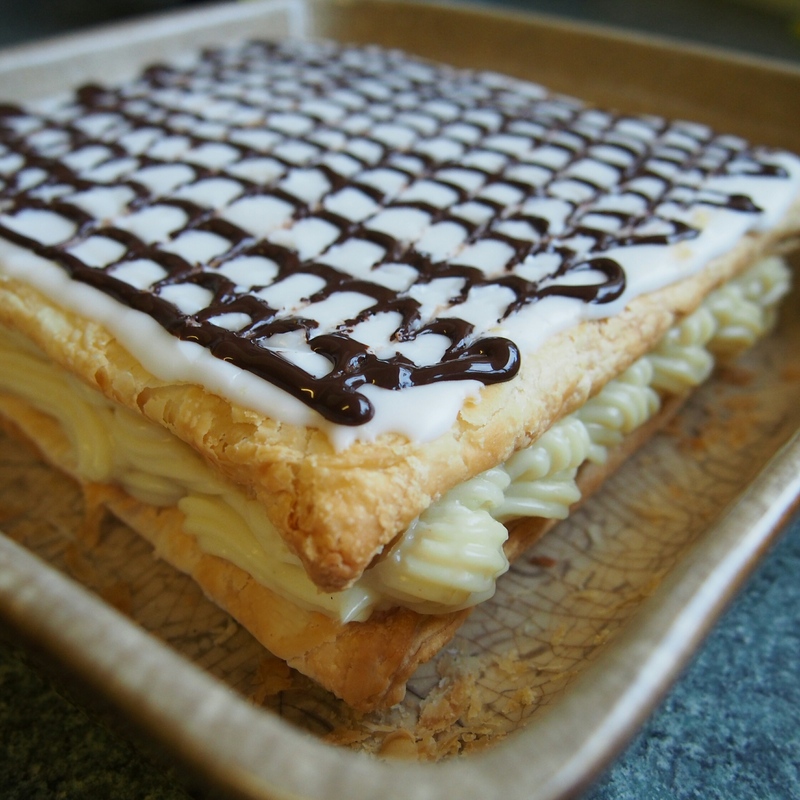 Line a 9×9 inch square baking tray with foil, wrap foil over sides to help lift out the finished custard slices. Prepare your pastry cream following the recipe below and set aside to cool. Bake puff pastry sheets until golden, usually approx 15 minutes, keep checking. Once golden set aside to cool. Load the cooled pastry cream into a piping bag with a large nozzle. 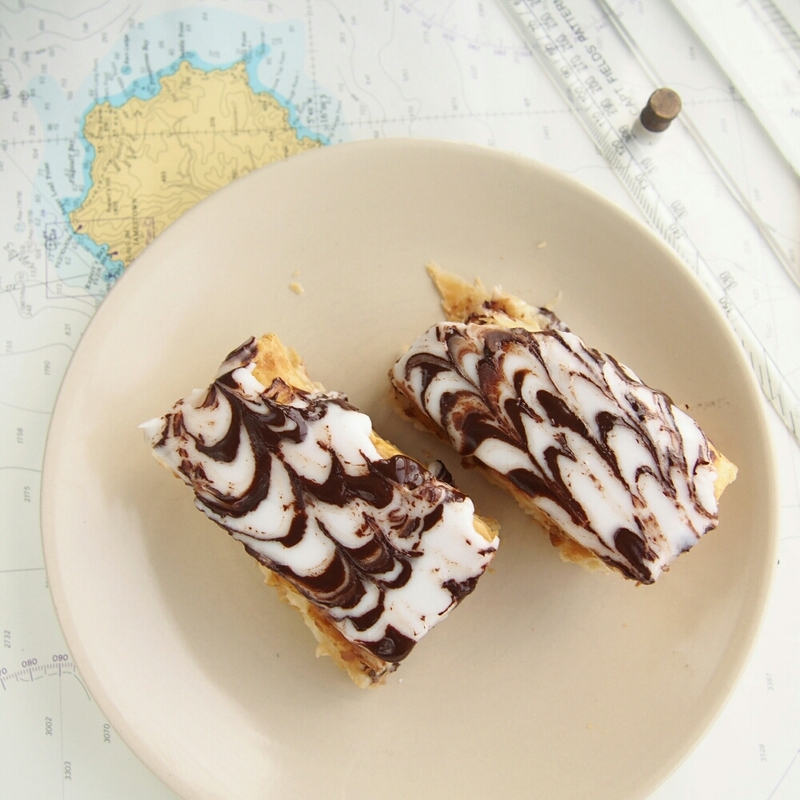 Place one piece of pastry in the foil lined tray and pipe filling neatly and evenly over the piece of cooked pastry. layer up until filling is about 1½ to 2 inches high. This will be the bottom layer and filling for your custard slice. 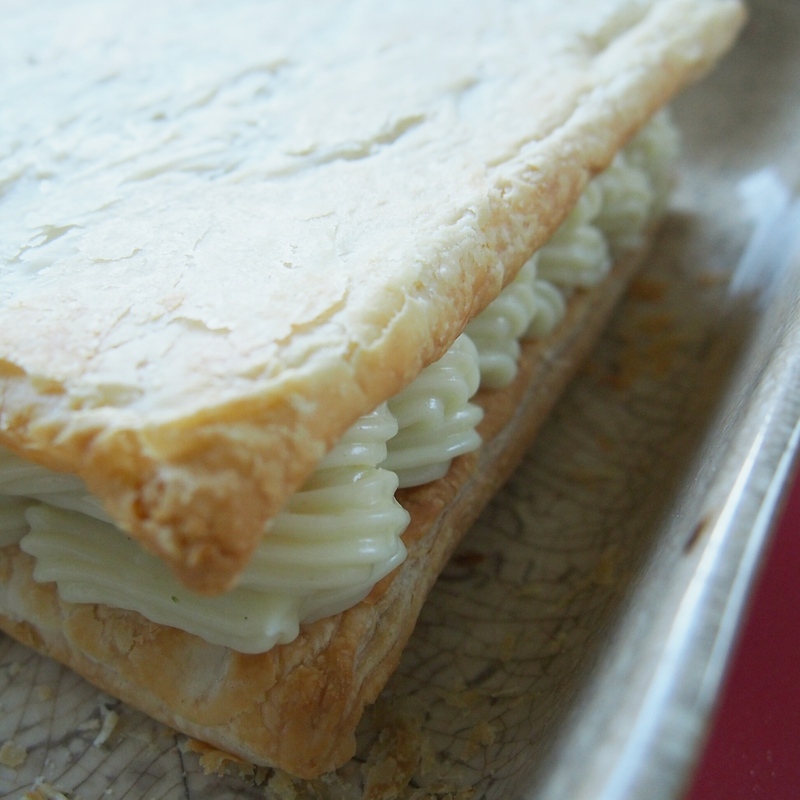 Gently place the other piece of pastry over the top, the flattest side up. Place in fridge while you prepare the topping. Melt chocolate in a double boiler. Mix up the icing by whisking together the icing sugar and water, then evenly and gently spread over the top layer of pastry until covered. To decorate, place the melted chocolate in a piping bag with a small plain nozzle, and pipe horizontal lines about half an inch apart across the top of the icing. Then using a toothpick, drag lines the same distance apart the opposite direction to create the cross effect. Let custard slice set completely in the fridge for at least 30 minutes before carefully slicing. Heat milk gently in a saucepan until warm, do not boil. In a mixing bowl, mix cornstarch, flour, sugar, water and salt and whisk will an electric attachment (or vigorously by hand), until well incorporated. Add half of the warm milk to the mixing bowl and whisk together, then pour everything back into the saucepan and return the saucepan to a medium low heat. Whisking or stirring continuously, heat mixture until thickened. Once large steam bubbles emerge on the surface, continue to cook for 2 more minutes, stirring to make sure the bottom does not burn. Remove from heat and whisk in the vanilla extract. Transfer mixture to a small bowl, and place some plastic wrap directly on the surface. Set aside to cool until needed. How much water should be added to the pastry cream? The recipe says ¼ water, but no unit. Hello! The photos look incredible..
I’m confused about the pastry cream. The instructions say to use half the milk..then doesn’t account for the other half in the pastry cream recipe? Thank you! That does make sense! I made these because vanilla slice is one of the things my husband missed the most since we became vegan. He was thrilled!! They are just like the shop ones he used to buy! Have you ever made it substituting the plain flour for a gluten free alternative. If so what have you had success with? looks gorgeosu! As a cheat I have used Bird’s csutard, which is “accidentally vegan”. Works pretty well in a pinch but I want to give your recipe a go. Hi. I have taken that recipe down sorry! I must change the link on the site too. After returning home I tried the recipe a few times in UK in a normal oven and have not been 100% happy with the results as i was the first time i made them …. so want to improve the recipe before reposting. Sorry to disappoint! I want to try this one. How about storage? How long will they last? Would you please tell me what heat setting you used when you cooked the pudding. It seems like a dumb question, but I have had recipes call for high to low, and I do not want to mess the custard up. Thank-you so much!! Hi suzie. I will have to test this recipe again on a regular oven. I made this on an old marine oven so there are no gas marks etc to go by. I think it was also vary a lot depending on your oven. The best thing always to do with custard is to start off on a low heat if your not sure and go from there, increasing a tiny bit if it doesn’t thicken. I made this today (setting now). I subbed arrowroot for the cornstarch (I have a severe corn allergy) and omitted the vanilla (again, because of the corn allergy and I didn’t have any homemade on hand). It is very thick and gluey. Have you ever tried this with arrowroot? I guess I now know a 1 to 1 sub doesn’t work, but I wondered if you have a better idea? Thanks! It is meant to be quite thick but gluey doesn’t sound quite right. I use a piping back to spread mine out evenly along the pastry. Great recipe, I must admit i’ve tried these before without much success, my hubby never complains and mops up the failures and the good ones. However I was very pleased with myself turning these out perfectly. Thanks for all your efforts, it was well worth it ! I am so going to make these, your blog has been a lovely discovery for me. Thank you. Holy moly! 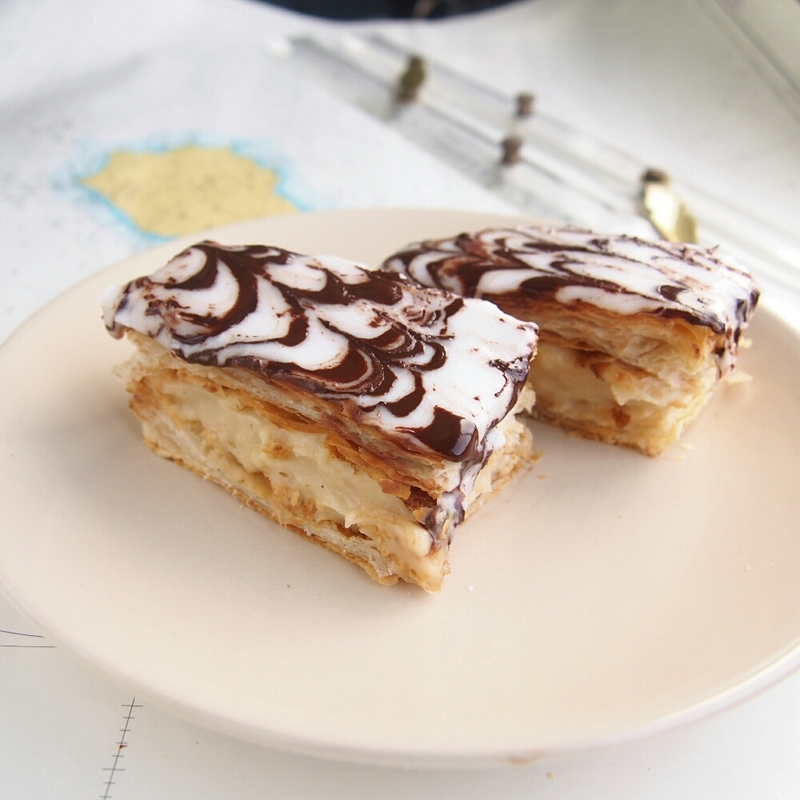 Vanilla slice is pretty much one of my favourite desserts. I’ve made it a few times, but never with such a pretty and creamy filling – mine has always been a solid ‘snot block’ as my dad used to call them. Definitely going to give your recipe a try! That’s gorgeous! And puff pastry is one thing I never make, apparently the machines making the store bought stuff can do a way better job than I can!